From the first day you move into your residence hall room as a first-year, to the day you walk across the stage to receive your diploma, President Craft is there to cheer you on. He spends move-in day carrying suitcases and futons, but even more so letting students know he is excited for their learning and growing ahead and assuring parents their students have found a new home away from home. And he'll get to know you as a scholar and care about you as a person. 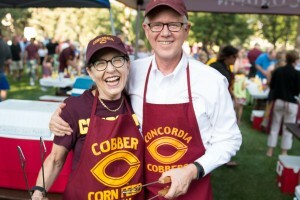 Because being the president of a college like Concordia can be a little different than other schools. Dr. Craft knows every Cobber has something important to offer this world and Concordia has something important to offer them. When you see the Crafts around campus, be sure to say hello. Introduce yourself and know they want to get to know you!